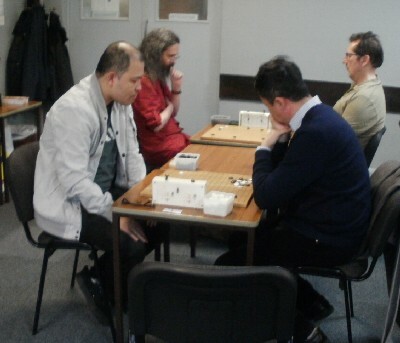 Yangran Zhang (3d Manchester), seen seated on the left, won the 20th Cheshire Tournament. A record 46 players took part, thanks to a large group from Cheadle Hulme School, as well as players from Liverpool, Manchester and other local clubs. 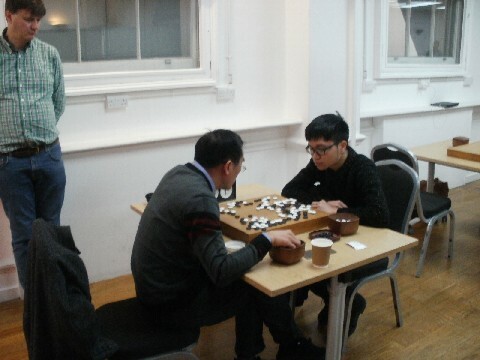 Yangran beat Gong Cheng, Mark Zhang and Alistair Wall to take the title. Also winning three games were Ai Guan (7k Lancaster), Chun Yin Wong (11k Lancaster), Andrew Boyd (13k Liverpool), Gordon Hall (20k Whaley Bridge) and Elliott Barlow (30k CHS). Hugo Ryan (35k CHS) won the Fighting Spirit prize, Ben Howe (27k CHS) won 6/10 in the 13x13 and Elliott also won a prize for 9/9 in the 13x13. Last updated Tue Feb 06 2018. If you have any comments, please email the webmaster on web-master AT britgo DOT org. The Winter 2017-2018 edition of the BGJ is now available for members to read. Last updated Wed Feb 21 2018. If you have any comments, please email the webmaster on web-master AT britgo DOT org. The fifth round of the B-League on 23rd January saw the UK playing Finland. Yet again our team did extremely well, winning the match 4-0. As top placed team Netherlands lost to Germany 3-1, the UK team returned to the top spot, on boards-won tie break from Germany (18-16); Netherlands dropped to third. Bruno Poltronieri wrote about his game against Javier-Aleksi Savolainen: I won by resignation. Not much happened until I decided to start poking at his floating group in the top right which seemed a bit over extended. I started with a peep, which he didn't really answer, so I was able to cut off a chunk of the group and kill it. In exchange he got a ponnuki in the centre, but since I had strong centre stones nearby it wasn't really worth much. After that I had a big lead. The 24th annual European Youth Go Championship (EYGC) will be held in Kiev, the Ukrainian capital, during the 2018 Easter holidays. This is the biggest youth competition in Europe, and there are already over 100 youngsters registered, from 8 countries, as at 21st January. There are three age groups: Under-12, Under-16 and Under-20. The BGA has arranged for a group of UK juniors to attend, with the support of DeepMind. The UK party is 16-strong, as at 21st January - all with flights booked (also accommodation - in one hotel where our own evening 'UK team room' is available). Entry to the competition - and the UK group - is still open, however. The upper age cut-offs for U12 and U16 will be taken as at 31 August of 2006 and 2002 respectively. The first three days include lectures, coaching and excursions and the last three days are the tournament. It is possible to attend just the tournament. Alistair Wall (1d) from Wanstead Club in London travelled up to Edinburgh for their annual Christmas Tournament. He topped the list of 19 players at the Skyscanner offices by winning three games out of four. He beat local player Boris Mitrovic (2d), but lost to another local Liu Yen-Ting (1d) who won two out of two. Others winning three games were Roger Daniel (6k Wanstead), Serhii Gavrylov (7k) and Edinburgh players Robin McLean (10k) and Neil Sandford (15k). Last updated Sun Dec 17 2017. If you have any comments, please email the webmaster on web-master AT britgo DOT org. He opened adventurously with four 11-3s. Especially as I wanted to play territorially anyway, this set bells ringing in my head that this should be a territorial game (hard to make frameworks, so I focused on the corners). He invaded 3-3 into my star point and his result was poor when I took the corner (the 10-3 was an inefficient one space extension from a ponnuki). This year's Coventry Tournament had a new organiser, but the same winner as last year. Taking over the organisation was Norwegian 4d Jonas Egeberg, and local player Philip Leung (4d) again won all three games to top the field of 40 at the event, held in the University of Warwick's Social Sciences Building. Second was Lucretiu Calota, 4d St Albans, and the organiser himself was a creditable third. Players lower down who won all their games were Andrew Russell (4k Birmingham), Michael Kyle (6k Manchester), Alan Stokes (8k Manchester) and Pierre Oliviere (15k St Albans).